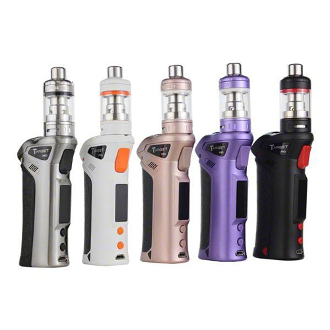 The Vaporesso pro is targeting the vaper community with its good looks and high performance. It is a 75 watt Mod that can handle many styles of coils, due to its temperature control mode, including: NI, SS, TI TCR. It takes the one 18650 battery and has an oled screen which displays battery life, ohm readout, and variable settings. The Target Pro Mod is paired with its corresponding Target Pro Tank. The tank includes the cCell Coil design making it able to handle any mode and output you set your device too. The Kit is 510 Threaded and can be customized to fit with other 510/ego clearomizers for the customer’s desired combo.